Educational research out of Stanford in the 1980’s with teachers and teaching performance reported that an approach focusing and building on the teacher’s ‘assets’ (i.e. their strengths, and what they did well) promoted high quality learning, while an approach focusing on the teacher’s ‘deficits’ (i.e. their weakness, and correcting what they were doing ‘wrong’) was far less effective in eliciting quality learning. Yet this ‘deficit-based’ approach is still out there in education and in behavior change. One of the best known hypotheses in the area of Successful Aging is “The Compression of Morbidity”. This refers to the idea that the period of sickness (morbidity) at the end of life may be reduced (compressed) by adopting healthier lifestyles. This hypothesis has recieved much attention in the field of gerontology and as a professor I have talked about it myself on many occasions. With my ‘new thinking’ hat on however, I see that, although this hypothesis was clearly aimed at doing good, it was actually taking the ‘getting less bad’ approach. Not much assett-kicking going on here! Instead there is an obvious dichotomy between “Successful Aging” – a positive, asset-based concept, and “The Compression of Morbidity” a negative, deficit-based concept. So here’s my Teleosity-based, assett-kicking version of this hypothesis. You heard it here first! Instead of “Compression” – why not “Expansion”? Instead of “Morbidity” – why not “Mobility”? And so we have “The Expansion of Mobility”. In other words ‘being better, longer’ instead of ‘being worse, shorter’. I like it already! So as you think about situations and goals in your life – what assets are kicking up for you? Back in 2000 when I was an assistant professor at Arizona State University, I was invited to be first author on a book chapter in a major publication called The Handbook of Health Psychology. The title of the chapter was “Effects of physical activity on physical and psychological health: Implications for exercise adherence and psychophysiological mechanisms” (A pretty long and involved title I admit, but then this was a pretty long and involved book – I was actually Chapter 38 out of 51). The reason I bring this up here is that in my research for writing this chapter I was struck by the fact that almost everything on ‘psychological health’ out there in the scientific literature was about ‘getting less bad’. I still see the same thing out there today, with the rationale for setting wellness goals such as ‘getting active’, ‘getting fit’, or ‘eating healthy’ predominently based either on reducing your actual bad stuff or on reducing your risk of bad stuff. With a moment’s thought you could probably come up with your own list of the usual bad stuff culprits: overweight, obesity, high blood pressure, high blood sugar, stress, depression, anxiety, risk of a heart attack, risk of a stroke, risk of dying, etc. I suspect this is a consequence of living with our ‘Medical Model’ of health which is uniquely designed to kick in and fix the ‘bad stuff’, and has little or no designs at all on the ‘good stuff’. The result of this is that we tend to view our wellbeing more in terms of how bad we aren’t rather than how good we are. When we try to set and achieve our wellness objectives we tend to focus more on overcoming obstacles rather than achieving goals, to focus on what we are not ‘getting’ rather on what we are ‘getting’. It reminds me of the lady I described in my last post. Even though she was truly gaining significant and meaningful benefits from her regular walking, her first response was to focus on what she wasn’t getting “It’s not fun”. What I know as a scientist and Intrinsic Coach® is that focussing on the positive aspects of pursuing an active lifestyle will bring you a host of positive benefits – you’ll look better and feel better about your self and your life, be more alert, have more energy (usually this is substituted with ‘less fatigue’), clearer thinking, better quality of life, better sleep. And there’s more …. So … As you read about these benefits – what positive things are coming up for you? FUN! I was thinking about that word the other day. I keep reading that when people want to be more active they should ‘make it fun’ or ‘find something that is fun’ or even ‘find something you enjoy’. I saw these same kind of suggestions in some of this year’s recycled ‘ten sure-fire tips’ to stick to your New Year’s exercise program (Déjà vu all over again?). Of course if you can find an exercise that is Fun, then you are well on your way to a long-term love affair with exercise and your active lifestyle is virtually assured. My point here however is that if you look only for Fun or if you think it always has to be Fun, your options are more likely to be limited, and your intentions are more likely to be compromised. What prompted this line of thinking was a conversation I had recently while standing next to a lady doing some walking on a treadmill (She was doing the walking, I was doing the standing). We were chatting about the usual kind of stuff – ‘How do I get rid of my flabby arms?’, ‘What’s the best kind of exercise to do to lose weight’, etc. I was talking about the fact that she was already doing something really positive by walking on a regular basis when she said “But this isn’t fun”. To which my response was “Who said it had to be fun”. Of course this got a big laugh from her and her neighbours who automatically thought that the ‘jock’ in me was speaking (See the image above “50 more reps and you WILL be having fun or suffer the consequences!”). However that was not the point I was trying to make. The day before, this lady had seen me in the gym as I was coming to the end of a fairly intense session on the elliptical trainer. There I was in front of her cranking away, sweat flying, arms pumping. I asked her “When you saw me on the elliptical yesterday, did it look like I was having Fun?”. Again she and her neighbours laughed but (without quoting the resulting conversation word for word), the point I tried to make in the ensuing conversation was that, while I was definitely experiencing a number of positive physical and mental feelings during my workout, ‘Fun’ was not an appropriate descriptor of what these feelings were. Empowerment, self esteem, a sense of achievement, ego, being in control of my body, a sort of sense of completion, of being in tune with the rhythm of my movements – any of those – or more – could describe what I was feeling. But FUN? This didn’t even come close to what I was experiencing. FUN is defined in the dictionary as “enjoyment or playfulness”, or “something that provides mirth or amusement”. It is certainly a pleasant feeling, and one that almost by definition, is rather trivial and not long lasting. In other words not something in my mind likely to persuade you to adopt any kind of long-term behavior change (like regular exercise). So I said to this lady “I see you here on a regular basis, so what is important to you about what you do here?”. She thought for a while (actually for about 20 yards at 4 mph), and said. “It’s walking with my friend here (pointing to the lady on the next treadmill). We chat about things and the time just goes by”. I let some time go by without filling in the silence. Then she said “You know what the best thing is? When we walk out of the door at the end of the session, I feel really good about myself because I have achieved something”. Sounds to me like a lot more than “Fun”! So as you think about this story – what is important to you about being active? “… any activity performed by skeletal muscles that results in energy expenditure”. Ok I know, I know, scientists tend to use lots of words, but really all they were saying here is any kind of bodily movement would count as physical activity. Their summary of all this research (the Report was almost an inch thick) was contained in a single sentence. “Moderate intensity” was any activity that felt as hard as a brisk walk. So what this means is that if you do something that feels about as hard as a brisk walk and do it in short bouts throughout the day that added up to around 30 minutes, you would get great health benefits – start feeling better, looking better, doing better. And the really cool thing is that the ‘something’ you do that feels as hard as a brisk walk, doesn’t have to be the same ‘something’! So 10 minutes of vacuuming (at a faster pace than usual) in the morning, 10 minutes of brisk walking before lunch and 10 minutes of raking leaves (at a faster pace than usual), would give you 30 minutes of moderate intensity physical activity. This almost sounds too good to be true. However more than 5 decades of peer-reviewed research supports this approach. Take my word for it. 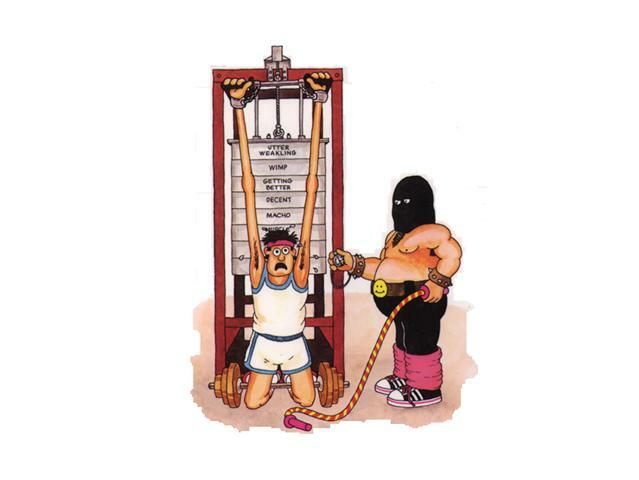 So all those years ago – with technology and exercise physiology still in its infancy – Per-Olaf Astrand’s recommendation (See previous post) to ‘be a high energy user, not a low energy user’, really nailed it! What a guy! The final thing is that these same SGR scientists also calculated that 30 minutes of ‘moderate intensity physical activity’ worked out to around 150 Calories, and that you could get to this number (and recieve the same health benefits) by doing some things for a shorter time at a higher intensity and some things for a longer time at a lower intensity. 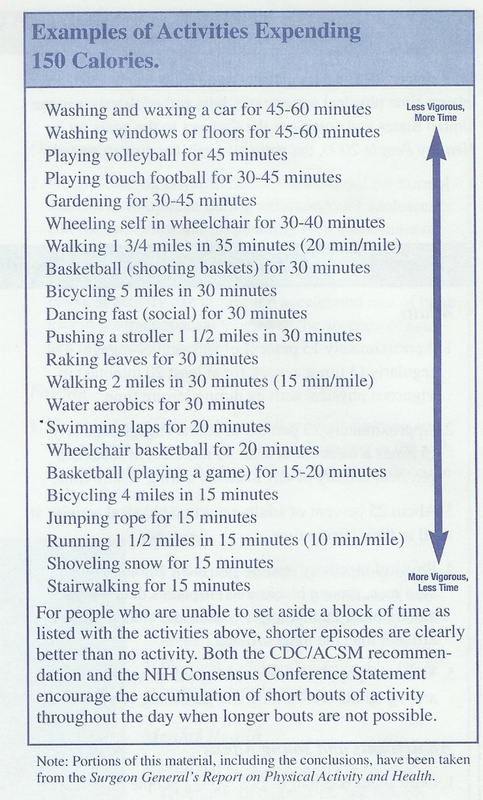 The graphic illustrates some options for burning 150 Calories by performing a range of what you might call ‘Activities of Daily Living’. Some of these options may work for you and some not. However as you think about this information and your lifestyle, in your own home and in your own environment ….. what’s coming up for you? Parkour is the art of moving through your environment using only your body and the surroundings to propel yourself. It can include running, jumping, climbing, even crawling, if that is the most suitable movement for the situation. Parkour could be grasped by imagining a race through an obstacle course, the goal is to overcome obstacles quickly and efficiently, without using extraneous movement. Apply this line of thought to an urban environment, or even a run through the woods, and you’re on the right path. Because individual movements could vary so greatly by the situation, it is better to consider Parkour as defined by the intention instead of the movements themselves. If the intention is to get somewhere using the most effective movements with the least loss of momentum, then it could probably be considered Parkour. Although it is not described as an ‘extreme sport’ the movements in all of the videos I looked at would be pretty hairy for most individuals, and at least from my first brief look, suitable only for highly active people in great shape – or willing to train up to great shape. Which brings me to my title above. A quote (with my paretheses) taken from Per-Olaf Astrand perhaps the grandfather of Work Physiology/Exercise Physiology. “Be a high energy user, not a low energy user”. He was of the opinion, way back in the 60’s that people could get great health benefits from using just a little more energy throughout the day. While Parkour certainly does this, most of us can fulfil this goal at much lower and more manageable levels of exertion. Most tasks in life can be done at a slightly elevated speed or with just a little more effort. Research has shown that anyone can get great health benefits by adopting this “higher energy user” approach to life. Even better, you can achieve this by going a little faster, or a little longer. As you think about this and the tasks in your life ….. what’s coming up for you?